#1 Oculus Go Rental Co. Rent Oculus Go from the most trusted VR rental partner. From cutting-edge equipment and comprehensive event planning to a huge VR experience library and on-site support, we've got you covered. Our Oculus Go VR experts will take care of everything from equipment to guest experience, so you can focus on other event responsibilities. 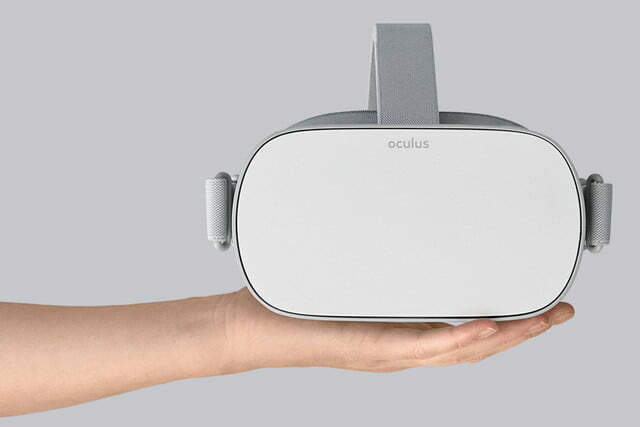 Based on the Oculus Rift, the Oculus Go brings you a virtual reality experience without any of the wires or additional equipment needs. Much like the Rift, the Oculus Go allows you to explore virtual environments through 360˚ video, VR games, and has now even introduced new social apps to connect with others while you experience VR. Plus, they’ve taken comfort to the next level with a super lightweight design and headset straps made of the most breathable fabric used in any headset to date. The Oculus Go is all about comfort and mobility, making it a perfect event activation. Offering a combination of what you find in standalone headsets and what you’ve come to expect from Room-Scale VR systems, the Oculus Go presents an impressive, flexible VR guest experience. Within the headset, you’ll find a pair of special VR lenses that allow for extremely high quality video. You’ll also benefit from a wide field of view that ensures you get to take in all of your virtual surroundings. Of course, your lenses, and your field of view, aren’t worth much if you’re looking at a low quality image. You never have to worry about that with Oculus Go as it incorporates a high-resolution 2560 x 1440 screen that assures your VR experience is always crystal-clear. While there are many experiences for the Oculus Go that only require a headset, some of the games available for the system do require a controller. For that, they have developed a special controller to enhance the Oculus Go gaming experience. Incorporating a “nunchuk” style design, each controller houses a touchpad, two face buttons, and a trigger located on the back. Another benefit of the Oculus Go is that it incorporates a “spatial audio” system that eliminates the need for external headphones. With an impressive list of experiences already dedicated to the system, and more sure to come, the Oculus Go is one of the most exciting VR options on the market today. This event activation is a surefire way to make an impression on your guests, and we’re here to help you make it happen. If you want to know how you can incorporate the Oculus Go into your next event, just let us know and we’ll be in touch ASAP! "Hands-down the easiest way to get into VR"
"...it’s the most accessible VR headset yet..."
"Oculus Go takes 360 VR to the next level!" "It's crazy how real it is"
"I can't stop using it."